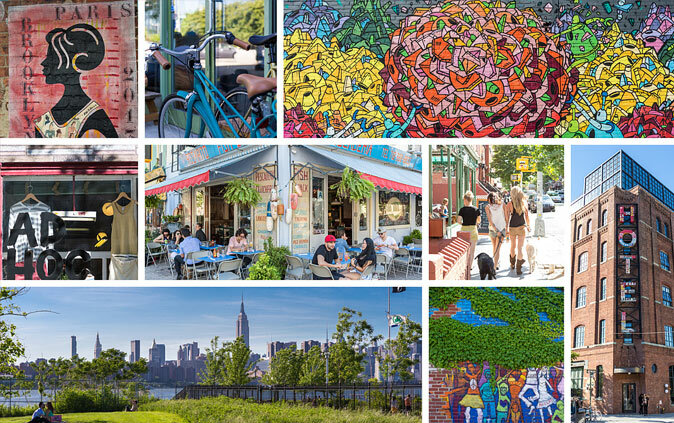 Williamsburg is not just a neighborhood; it’s a destination whose energy and excitement is evident on every block. Overlooking McCarren Park, 34 Berry is steps from sought-after boutiques, galleries, restaurants, bars and clubs, and THE BEST indie music. And your block includes both Brooklyn Bowl with its vibrant club scene and Blue Ribbon menu, and Brooklyn Brewery where you can throw back a locally brewed, micro beer. 34 Berry is an oasis from city life - between the beautiful back garden and the well-maintained building - this is a relaxing place to return at the end of a busy day. 34 Berry gives you everything you thought you couldn't afford in New York- modern spacious rooms, great amenities, and the hottest location in the hippest 'hood. Loving it! 34 Berry is a wonderful community to live! Everyone is extremely friendly and it feels like home. I also love that it is pet friendly so my little dog is comfortable as well. 34 Berry is an exceptional property near the heart of Williamsburg. The people that run and maintain the property are always there to help and take great care of both the place and the tenants. 34 Berry is like living in a hotel! They do a wonderful job at making this more than just a place to live, its a a lifestyle that is so far superb. 34 Berry is the best of all worlds for living in New York City. The staff is welcoming and at the ready to make this place a home, the amenities offer conveniences and luxury without being over-the-top and the apartment itself is just the right size. In-unit laundry! Need I say more? After 10 years of living in Manhattan, I moved to 34 Berry 2.5 years ago. I love living in 34 Berry in Williamsburg and hope to be here in the years to come. I couldnt ask for a better location than 34 Berry. It is not only located a few blocks from the subway but also surrounded by so many amazing restaurants, bars, stores, bowling alleys and even a beer brewery! McCarren park, which includes everything from tennis courts, track field to a pool, is located across the street from 34 Berry. Have all the good of a home without dealing with the maintenance. Incredibly pleasant, best apartment I've ever had the pleasure to inhabit. Excellent interactions with staff; really makes it feel like home. I've lived at 34 Berry for three full years now - I was the first person in my apartment. Each of them has been a pleasure. The staff is so kind and lovely and professional - they make coming home a true pleasure. The building is always clean and kept up and has great amenities, and the apartment itself has stayed in great condition throughout my stay in the building. My experience while living at 34 Berry during the last three years has been excellent. The apartment building amenities as well as my living space make it truly feel like a home. The staff is one of the friendliest and accommodating staff that I had the pleasure of from my renting experience in the last 15 years of living in NY. Superb front-desk staff, excellent maintenance staff, wonderful amenities, great living all-around. The living experience is Great at 34 Berry! This is my fourth year at 34 Berry and I can't speak more highly about the building and the staff. Literally everyone there is so friendly and helpful - it is a true pleasure to come home every night. It really feels like a community. The building is extremely well kept-up and has every amenity one could want. We've lived at 34 Berry since its opening more than 3 years ago. Overall, our living space, amenities and service has been fantastic. Any maintenance requests have been resolved with 24 hours and the concierge, doormen, and maintance staff are friendly and professional . We've renewed each year because we felt the value of all of these important aspects of an apartment in Brooklyn/NYC have been well worth it.